Lasith Malinga registered his second five-wicket haul in the Asia Cup, next only to the five for 34 versus Pakistan at Dambulla on June 15, 2010. He is the first bowler to record two instances of five wickets in an innings against Pakistan in the Asia Cup. Statistical highlights from the opening match of the Asia Cup, which Sri Lanka won by 12 runs. # Angelo Mathews's unbeaten 55 off 50 balls was his 18th fifty in ODIs, his fourth against Pakistan. # Mathews registered his fifth fifty as captain in 23 innings. With this, he equalled his highest score in the Asia Cup. His first half-century was an unbeaten 55 versus Pakistan, at Dambulla, on June 15, 2010. # Mathews's Asia Cup record is brilliant. He averages 152.00 -- his tally being 152 runs in four innings and thrice not out. # Kumar Sangakkara and Lahiru Thirimanne were involved in a partnership of 161 runs. It is Sri Lanka's highest for the second wicket in the Asia Cup. It is also the country's highest for the second wicket against Pakistan in ODIs. 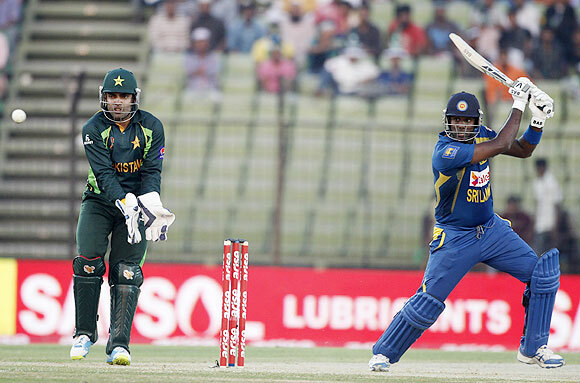 # Sri Lanka, in beating Pakistan by 12 runs, equalled their narrowest victory margin in terms of runs at the Asia Cup. They had defeated India by 12 runs at Dambulla on July 18, 2004. # Sri Lanka (296/6) registered their second highest total against Pakistan in the Asia Cup, behind the 302 for seven at Karachi on June 29, 2008. # Umar Akmal (74 off 72 balls) posted his third fifty in the Asia Cup, his second against Sri Lanka. He registered 18 fifties in ODIs, six against Sri Lanka. # Akmal's aforesaid innings is the highest by a Pakistan wicketkeeper in the Asia Cup. Thirimanne in same league as Attapattu! # Lahiru Thirimanne (102 off 110 balls) equalled his career-best score in ODIs. He scored an unbeaten 102 off 134 balls versus Australia at Adelaide on January 13, 2013. # Thirimanne became the third Sri Lankan batsman to register a hundred against Pakistan in the Asia Cup. Marvan Atapattu had scored 100 off 124 balls at Dhaka on June 7, 2000 and Kumar Sangakkara 112 off 110 balls at Karachi on June 29, 2008. # Thirimanne's 102 is his first hundred as an opener in ODIs. # Kumar Sangakkara (67 off 65 balls) posted his 84th fifty in ODIs -- 10th fifty vs Pakistan. He has three hundreds and seven fifties in the Asia Cup, aggregating 894 in 19 innings at an average of 49.66 in 20 matches. His tally of ten innings of fifty-plus is a record by any batsman in the Asia Cup. # Misbah-ul-Haq's 36th fifty (73 off 84 balls) in ODIs was his ninth against Sri Lanka. # Misbah's Asia Cup record is quite impressive -- his tally being 349 in nine innings, including four fifties, at an average of 69.80. # Lasith Malinga (5/52) registered his second five-wicket haul in the Asia Cup, next only to the five for 34 vs Pakistan at Dambulla on June 15, 2010. He is the first bowler to have two instances of five wickets in an innings against Pakistan in the Asia Cup. # Malinga has six instances of five wickets in an innings in ODIs, including two against Pakistan. He has now captured 250 wickets (ave.26.96) in 163 matches -- a Sri Lankan record for the fastest to 250 wickets in ODIs, bettering Muttiah Muralitharan's feat of reaching the feat in 174 matches. # Malinga became the fourth bowler to complete 250 wickets or more for Sri Lanka in ODIs, joining Muralitharan (523), Chaminda Vaas (399), Sanath Jayasuriya (320). In ODIs, Muralitharan captured 534 wickets, Chaminda Vaas 400 and Sanath Jayasuriya 323.